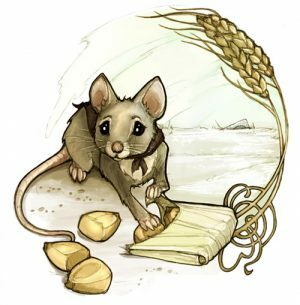 Originating from a realm where the dominant mammals are rodents and psychic abilities were considered the same as magic, Miss Suss Frizz-Bee seemed like an average field mouse -- from a family of agricultural sorts. However, when her 'magical' prowess revealed itself in a rather spectacular manner (she telekinetically moved her family's house to a safer location in their fields), her family saved up to send her to the magic university in the central city of their kingdom. After her little caravan was inundated by an unexpected storm, Miss Frizz found herself the only survivor, and in a place VERY different than where she'd been before. Everything was much, much bigger than she'd ever experienced before -- including her 'magical' abilities. Compel: Using that much power is bound to make her a target. A tiny, very squishy target. She's a field mouse. If she eats too much, she MIGHT weigh a full ounce. Invoke: Being tiny can be useful, as she can fit through and into places that are too small even for a human child's hand. Compel: She can VERY easily suffer very severe injuries if someone really tries to hit her. And she looks exactly like a rather common prey animal. Every hawk, cat, dog, and human around will initially see her as little more than a pest. It's difficult enough to get respect as a human. Imagine how badly people underestimate Miss Frizz because she's a mouse. Invoke: When doing or saying something that demands the respect of others. Compel: When being a mouse overrides any chance of being taken seriously. This is a big and scary world. The only way that Miss Frizz stands a chance is with friends to help her along her way. Invoke: Calling upon or relying upon friends to help her in dangerous situations. Compel: Finding herself in trouble without a single person she can rely upon. The most basic expression of this talent is mindspeak, allowing one or more minds to communicate to one another with mere thoughts. From there telepaths learn to influence others thoughts in ways both subtle and direct: planting ‘suggestions’, broadcasting a simple thought that says ‘you don’t see me’ or even outright attempting to take over someone’s body. Reading others thoughts as they become hostile, or even as they form the intent to attack can also give a telepath some major advantages. As a mouse, Miss Frizz has exceptionally keen senses of hearing and smell. Gain a +2 to all Notice and Investigate checks in which these senses apply. Yours is the power of the mind. Whether you can see into the astral realm, hear the thoughts of others or make your will manifest as physical force, you have a gift that sets you apart and elevates you to the levels few on Rifts Earth ever reach. Telekinetics is the study of turning the will into pure force and for as simple as that sounds it has a lot of application. ‘Arms reach’ becomes an antiquated notion for telekinetics. If they can see it, they can affect it (or at least try). Pushing, pulling, lifting, levitating. All of that is simple. Some psychics can take it to an extreme, using their mind to accelerate small objects like a firearm, or a railgun. Others learn to put up walls and fields of pure force, blocking things out or holding them up. Control of the mind is absolutely essential to a psychic and this is nowhere more true than when danger rears its head. Some times the best thing or the only thing that can be done to fortify the mind is to suppress any feelings of fear. Against more esoteric threats, psychics can shield themselves and their companions from having their mental and metaphysical energies harvested by those creatures – such as psi-stalkers – who feed on them. Finally, against mental intrusion psychics can engage their ultimate defense: closing themselves or their companions off. This utterly prevents the use of any psychic power at all, but also prevents any intrusion into the closed off minds. Psychics generally grow in power as they learn to train their will. Some have naturally deeper reserves of the mental energies used to employ their gifts. Hunter brings along a few of the usuals to the world of Pharsalos, but it's not all strictly for business. Elpida, Kaji and Miss Frizz are invited to interrogate the pixies that had attempted to make off with Slaine. Slaine's drawing the wrong kind of attention again, but thankfully her friends have her back. What sort of a beast is a Haber-Dasher? Aloysius and Miss Frizz are out 'shopping' and happen into Raine Douglass. Sanka'a comes looking for Aiden to discuss the attempt on his life. Suss is testing the first attempt at a Tiny Vesperite Transportation System, and asks Leo for advice. Aloysius and Elpida arrive in time to say hello. On a rainy day in Vesper, three people meet in Gran's dining room: A returning regular, a fixture, and a newcomer. And there is fresh juice. Those plagued with the mysterious dolls gather at the Academy to perform the ritual that will break the accursed link between them and their dangerous and deceptive dopples. Thar be Stygian demons in them thar mountains! Circumstances align in which certain components for dispelling an unusual doll problem becomes available. A newcomer in the city seeks out admittance into the Academy, but finds out it won't be as simple as just walking in. Aiden, Slaine, Elpida, Miss Frizz and Yaren venture into the depths of the Vesperian sewers to take care of this Rat King problem at the root. There's rat problems in the Dragon's Gate district and desperate attempts are made to try flushing them out. But what's really at work here? There's a new guy in town stopping by Gran's, unfortunately not without a few introductory faux pas. You Call This A Lodging House? Gran's has a bit of an infestation problem that quickly blows out of proportion. Professor Ingerhast lends her assistance to heal the rainbow serpent of her magical malady, providing guidance to those gathered to help. What better way to find someplace underground than to ask someone who lives there? Aiden, Slaine, Miss Frizz and Yaren lure out a Snake. A dragon cat with his head stuck in a sewer grate, fishing for green-eyed rats with his friends. If the night wasn't already strange, it gets weirder, pretty fast. Just another day at the Gran's. Well, except for having a couple of creepy dolls around. Kaji gets Miss Frizz and Elpida up to speed. Braed gets a meal. Jeshua accidentally discovers another potential ability of her's, accidentally startling Miss Suss in the process. Jeshua finds her way back to Gran's and gets a better feel for things in Vesper while the usuals at the B&B get a feel for her. Aiden and the others venture out through the D-shifting territories of the mountains in search of a possible Coalition presence. Interested parties drop by the Academy to gain some insight from the resident Spider professor regarding the mysterious doll plague. A certain Justicar stops by Gran's to further investigate rumors of strange, creepy dolls being delivered around the city. The plans of the Harvesters have been thwarted for now, and those involved in the battle have returned to Vesper for rest and retrospection. Joined by Megana and Miss Suss, Aiden, Elpida, Kaji and Slaine join the battle as Vesper's forces assault the Xombie forces, fighting their way to the Harvesters before Nxla can be freed! Finding a promising if curious job proposition, Kaji, Megana and Slaine go to see if they can get more details as to the task in question. Kaji and Miss Frizz take part in clearing out a few spirits from a haunted house. New acquaintances meet old ones in the streets of Vesper, and not without talk of the looming threat of the soulless. What was supposed to be a casual cafe visit ends with a business proposition as Miss Frizz accidentally meets Kaji's teacher in necromancy. Slaine warns Frizz of impending danger and not because she has a vision ... how did she know that was going to happen. Unpleasant visions once again take Slaine in the middle of discussing preparations for that date. Miss Frizz meets the Wandering Fennodi Preacher Dalia and her constant companion Krunch. A sudden vision Slaine receives turns out to be a little more than just a rude awakening for those at Gran's. Coming to visit from Saren's Rest, Yaren tries to catch up on the local events at Gran's and instead makes a tiny new acquaintance. Moving beds and screaming boxes! Is Kaji's room haunted?? Brother Devan takes refuge in the strangest place following his Dogwood ordeal. Slaine checks in with Elpida after the Tannery incident and Frizz gets bought up to speed. Funnelcakes are delicious. Miss Frizz-Bee and Auren think so. And an imp think Miss Frizz looks yummy. A surprise breakfast meeting turns interesting. Hungry cats don't know to let sleeping psychic mice lie. Sanka'a and Otmin seek out people to assist with a caravan that's been hijacked. Dragons hunting, a mouse exploring and Mage walking. What could go wrong? A discussion between psi-stalkers and a Dragon Cat in the Vesper market attracts some attention. There's a new arrival in Vesper. A tiny new arrival -- the pitter-patter of little feet -- but not the kind you're thinking. Miss Suss Frizz-Bee finds herself in a very strange place with very big... everything.